Complex, haunting, and profoundly literary, Didactic Poetries is French poet Philippe Beck’s response to Schiller’s statement: “We are still waiting for a didactic poem where thought itself would be and would remain poetic.” In recognition of his entire oeuvre, Beck was awarded the French Academy’s Grand Prix de Poésie [Grand Poetry Prize] in 2015. We present two poems from his debut publication in English, released by Univocal Publishing today. a taste for strong sensation. 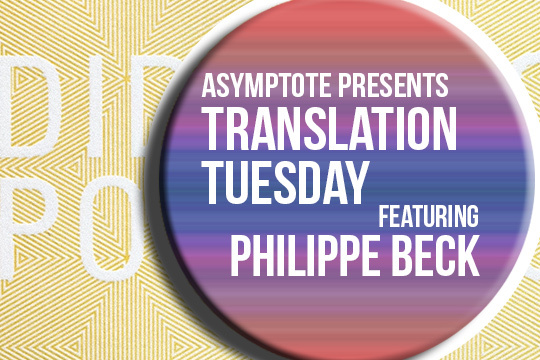 Philippe Beck is a poet and a professor of philosophy at the University of Nantes. He has published over 15 volumes of poetry as well as a number of theoretical works including, most recently, Contre un Boileau: Un art poétique (Fayard, 2015). Beck was awarded the French Academy’s Grand Prix de Poésie [Grand Poetry Prize] for his body of works in 2015. Nicola Marae Allain is an associate professor in Arts & Cultural Studies at Empire State College, State University of New York.